An interesting paper in « Case study in Engineering Failure Analysis » published on ScienceDirect.com. In this case study a failed locking compression plate was investigated. Such plating systems are used to provide the stability to fractured bone and fixation. 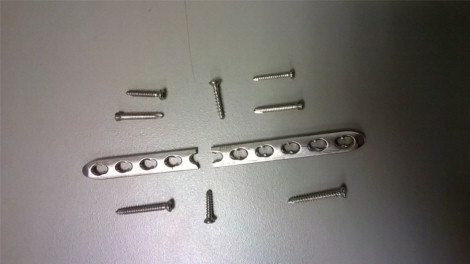 The locking compression plate had been separated in two pieces. One of the fracture surfaces from the failed component was investigated for surface topographical features. The visual, optical and scanning electron microscopy results indicated the presence of beach marks, intermetallic inclusions, corrosion pits and striations indicating fatigue crack propagation and overload failure. Some corrosion damage also was documented on the fractography. This case study shows that corrosion may have initiated fatigue crack which grew by the activities of daily living causing the failure. Ce contenu a été publié dans Publications par geraldb17, et marqué avec analyse de défaillance, Beach marks, cas concrets, case study, corrosion, Failure analysis, fatigue, Intermetallic inclusion, Screws, Striations. Mettez-le en favori avec son permalien.